I’ve finished one of my three UFO’s! 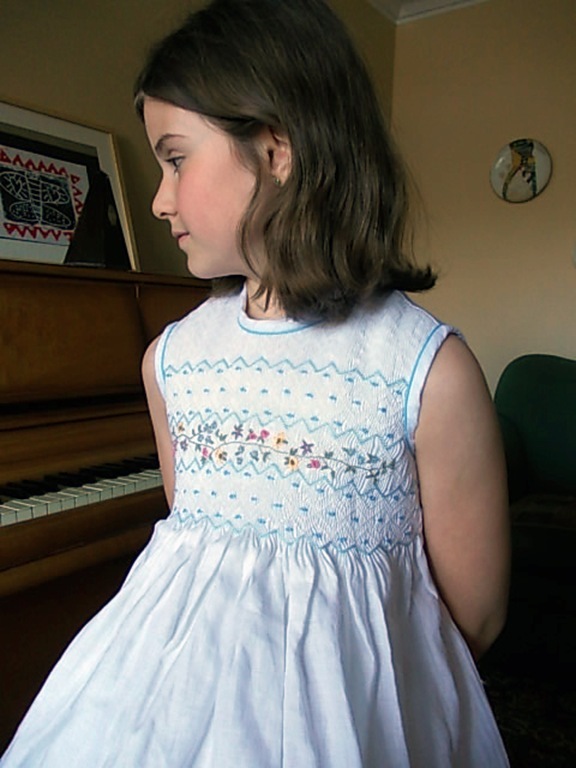 This was originally supposed to be DD3’s Easter dress three – read it: not one, not two, but THREE – years ago. But I never got around to finishing up the smocking or the embroidery. I was just not motivated. 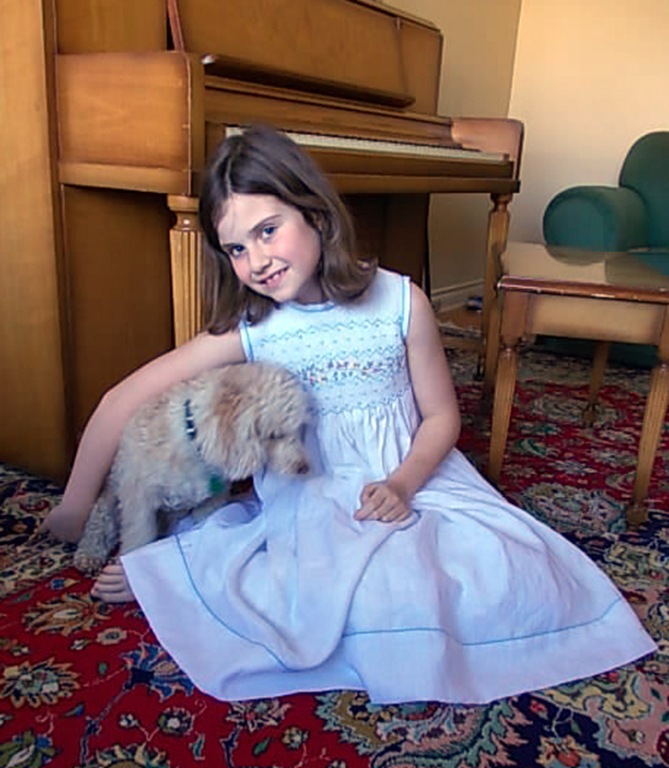 The dress pattern is from AS&E #74, and was originally sized up to a 7. I find that the Australian kids sizes are quite a bit bigger than US or European kids sizes. DD3 is really a size 10, but can still squeeze into this dress, although it’s a bit short on her. Needless to say, it’s going into the heirloom closet. It’s white linen with cotton smocking and embroidery. The original version has embroidered short tulip sleeves with piping and a piped embroidered peter pan collar, but I left them off because I thought it looked better without them. There’s a belt instead of the usual big long ties for a big bow at the back. It’s a nice touch and suite the clean lines of the dress. Although I really couldn’t be bothered to be a perfectionist about matching the widths of the belts since it involved turning one of them inside out and ripping out the piping and redoing it, it’s done, and that’s the end of it. I’m annoyed it’s not perfect, but I am not redoing it now. The bottom band is a double width of the linen. I’m happy with the piped and bound armholes and neckline. I think it ties the whole dress together. And now that I have buttons, I’ll be finishing up another UFO in the next couple of days. Yay! Beautiful dress and your lovely big girl looks beautiful. Aren’t kids gorgeous? Anyway, I wish my two would wear stuff from their older siblings but the eldest is a scant minute older than the youngest so that’s not going to happen. Then again I haven’t a drop of heirloom sewing blood in me so its probably just as well. Wow.. that truly is heirloom. It’s beautiful. I like the tabs, it’s a nice feature. Well, at least she can wear it long enough for photos! I have been wrangling with the outgrown-handmades monster here, too, especially since my younger daughter won’t wear most of what my older daughter outgrows. Absolutely beautiful work, and just so pretty. Your embroidery is sheer perfection; well, I love everything about this dress. Definitely an heirloom piece. So beautiful! I can only imagine the work that’s gone in to the embroidery and smocking! Well done!!! It’s beautiful! The smocking and the embroidery are stunning. Your daughter is very pretty too! What an awesome dress! I’m always in awe of those who smock. 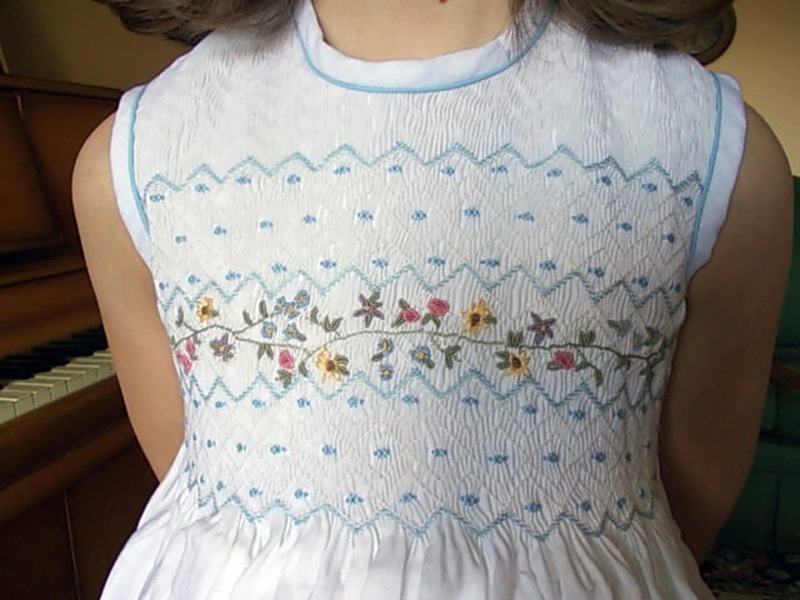 My DDs had home made dresses but never these beautiful smocked ones! I’m glad she did get at least one wear out of it before it headed to the heirloom closet. Believe me, your daughters will be glad that you held onto these pieces later when they’ve had their own children. I love it! Not only is it a finished product but you can lovingly fold it away for the future. There is little more satisfying than that. Beautiful work, and your daughter is lovely. 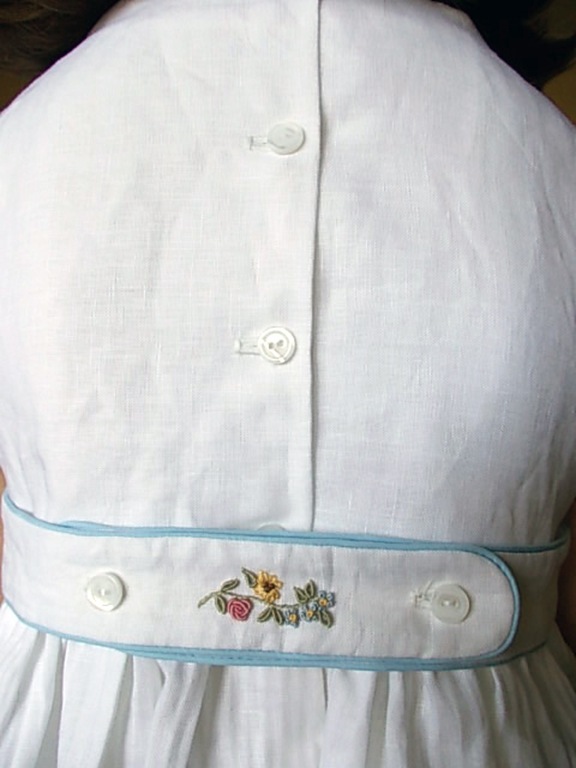 This is so pretty and so sweet and brings back lots of memories from my smocking days! Congratulations! Such delicate work! I wish we´d live closer so that you could teach me how to do some needle work. Amazing!